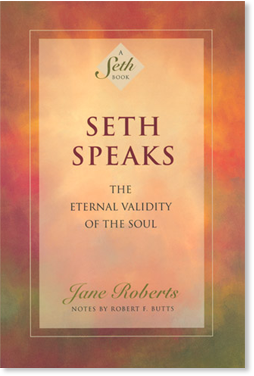 Seth Speaks (eBook) - Amber-Allen Publishing, Inc.
Seth Speaks, one of the most powerful of the Seth books, is an essential guide to conscious living. It clearly and powerfully articulates the furthest reaches of human potential, and presents the concept that we are independent of our physical image and have access to intuitional knowledge and other dimensions of reality. Seth Speaks has withstood the test of time and is still considered one of the most dynamic and brilliant maps of inner reality and human potential available today. This book was written by a personality called Seth, who speaks of himself as an “energy personality essence” no longer focused in physical form. He has been speaking through me for over seven years now, in twice weekly trance sessions. My psychic initiation really began one evening in September, 1963, however, as I sat writing poetry. Suddenly my consciousness left my body, and my mind was barraged by ideas that were astonishing and new to me at the time. On return to my body, I discovered that my hands had produced an automatic script, explaining many of the concepts that I’d been given. The notes were even titled — The Physical Universe as Idea Construction. Because of that experience, I began doing research into psychic activity, and planned a book on the project. In line with this, my husband, Rob, and I experimented with a Ouija board late in 1963. After the first few sessions, the pointer spelled out messages that claimed to come from a personality called Seth. Neither Rob nor I had any psychic background, and when I began to anticipate the board’s replies, I took it for granted that they were coming from my subconscious. Not long after, however, I felt impelled to say the words aloud, and within a month I was speaking for Seth while in a trance state. The messages seemed to begin where Idea Construction left off, and later Seth said that my expansion of consciousness experience had represented his first attempt at contact. Since then, Seth has delivered a continuing manuscript that now totals over six thousand typewritten pages. We call it the Seth material, and it deals with such topics as the nature of physical matter, time, and reality, the god concept, probable universes, health, and reincarnation. From the beginning, the obvious quality of the material intrigued us, and it was for this reason that we continued. . . I do not mean to imply that we have any cornerstone on truth, or give the impression that we wait breathlessly for the undistorted secrets of the ages to gush forth. I do know that each individual has access to intuitional knowledge and can gain glimpses of inner reality. The universe speaks to each of us in this regard. In our case, the Seth sessions are the framework in which this kind of communication takes place. You have heard of ghost hunters. I can quite literally be called a ghost writer, though I do not approve of the term “ghost.” It is true that I am usually not seen in physical terms. I do not like the word “spirit,” either; and yet if your definition of that word implies the idea of a personality without a physical body, then I would have to agree that the description fits me. I address an unseen audience. However, I know that my readers exist, and therefore I shall ask each of them, now, to grant me the same privilege. Names are not important, however. My name is Seth. Names are simply designations, symbols; and yet since you must use them, I shall also. I write this book with the cooperation of Ruburt, who speaks the words for me. In this life Ruburt is called Jane, and her husband, Robert Butts, takes down the words that Jane speaks. I call him Joseph. My readers may suppose that they are physical creatures, bound within physical bodies, imprisoned within bone, flesh, and skin. If you believe that your existence is dependent upon this corporeal image, then you feel in danger of extinction, for no physical form lasts, and no body, however beautiful in youth, retains the same vigor and enchantment in old age. If you identify with your own youth, or beauty, or intellect, or accomplishments, then there is the constant gnawing knowledge that these attributes can and will vanish. I am writing this book to assure you that this is not the case. Basically you are no more of a physical being than I am, and I have donned and discarded more bodies than I care to tell. Personalities who do not exist do not write books. I am quite independent of a physical image, and so are you. Consciousness creates form. It is not the other way around. All personalities are not physical. It is only because you are so busily concerned with daily matters that you do not realize that there is a portion of you who knows that its own powers are far superior to those shown by the ordinary self. You have each lived other existences, and that knowledge is within you though you are not consciously aware of it. I hope that this book will serve to release the deeply intuitive self within each of my readers, and to bring to the foreground of consciousness whatever particular insights will serve you most.